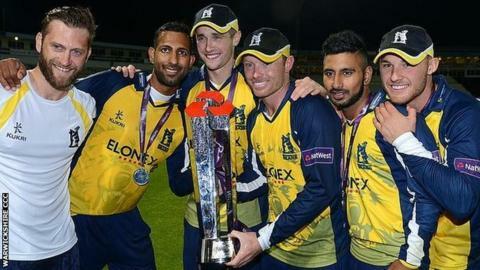 Warwickshire batsman Laurie Evans says that having England's Ian Bell as their new captain is already proving an inspiration to the Bears playing staff. There is still more than a month to go before Bell leads Warwickshire out for the County Championship opener against Hampshire at Southampton on 10 April, the day before his 34th birthday. But Evans says that, even in pre-season training, he has made a difference. "He sets an example in the way he works and goes about things," said Evans. "I've loved it. He brings an intensity to everything he does, which is what you need if you want to go to the next level. "He's brought that international work ethic. He trains differently, he thinks differently, he plays differently. He's probably better than the rest of us, so it's nice to watch him play." Will Bell play for England again? Having spent the past decade as an England regular, Ian Bell's omission from the South Africa winter tour has raised doubts about his Test future. But, having already retired from one-day international cricket with England, Bell himself has no intentions of packing in yet at Test level too. The fact that Joe Root, Ben Stokes and Jonny Bairstow were England's only reliable run getters on the four-match tour suggests that he still has a Test future - especially if he can find his form in early season. James Taylor (201 runs), Alex Hales (192), Moeen Ali (116) all averaged under 30 for the series, considerably below Bell's overall Test average of 42.69. How will the Bears perform with Bell in the team? Ian Bell has squeezed in just 21 County Championship appearances for Warwickshire in the past six years - and even that is a higher appearance rate than most of his England contemporaries in that time. But, having him back in the team, and even more fired up to score runs in an attempt to win back his England place, can only strengthen the Bears' bid to improve on last season's fifth-placed finish. "As a group we ended last season poorly," said Evans. "We weren't going about our cricket the right way, both on and off the field. "There were times we were not enjoying it. We needed the end of the season to come. Hopefully we can put that behind us. "A winter down, hopefully we've put right some of those things. The real test is when we have that first session when things have not quite gone our way. That will show the character of the side." Ian Bell led the Bears to a 13-run defeat in Friday's first of two Twenty20 warm-up friendlies against the West Indies, at the Dubai International Stadium. Responding to the Windies' 145-5, the Bears failed to plunder 23 off the final over, falling short on 132-4, despite 35 for Bell and opening partner Varun Chopra's 41. Laurie Evans will captain for the second of the meetings with the Windies on Sunday. The Bears then have five days of training ahead of the two-day game with Midlands neighbours Worcestershire in the Sheikh Zayed Cricket Stadium in Abu Dhabi the following weekend. "It was disappointing not to get over the line," said Bell. "But we played against a high-class international team who've been out here for some time. We're 48 hours off the plane. Even without some of our senior players, we pushed them close."